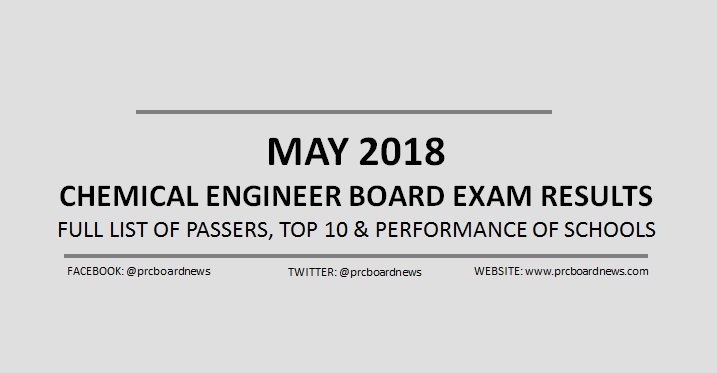 MANILA, Philippines – The Professional Regulation Commission (PRC) released results of May 2018 Chemical Engineer (ChemEng) board exam today, May 29 or in two (2) working days after the last day of exam. The complete list of passers, top 10 (topnotchers), top performing schools and performance of schools are available on this page as announced online. PRC administered the Chemical Engineer licensure exam in the cities of Manila and Cebu on May 23, 24 and 25. Note: This is in accordance with PRC Resolution No. 2010-547 series of 2010: WITH 30 OR MORE EXAMINEES AND WITH AT LEAST 80% PASSING PERCENTAGE. The two-day exam covered the following subjects: physical and chemical principles, chemical engineering principles and general engineering, ethics and contracts. In the May 2017 Chemical Engineer board exam, results were out online in two (2) working days. A total of 310 out of 561 passed the exams. In the May 2016 exams, results were also announced in just 2 working days. PRC named 320 out of 499 who passed the series of tests. Nanotechnology is a technology that will majorly affect the whole human race, it will influence the greater part of our lives, check here and its applications are changing how we see our general surroundings. The technology essentially endeavors to make minute parts that work can be gathered as a machine modified to do or play out an assignment for our motivation of the mission.